MamaEatsClean: Paleo Pumpkin Pie Brownies and a Summer Hours Announcement! Paleo Pumpkin Pie Brownies and a Summer Hours Announcement! 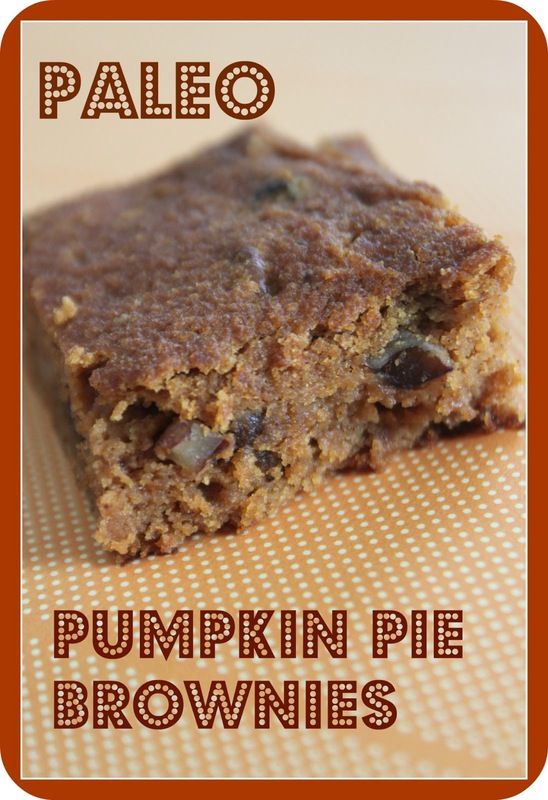 Coconut flour, pumpkin, pecans, raisins - yummy, yummy, yummy, mummy! I didn't know what to call this creation other than fantastically delicious..........so I went with brownie. Could have been square, slice, cake - whatever - you'll like it even if you don't think they qualify as a brownie as long as you like pumpkin pie. They are two-bite brownies - not much to them but they pack a lot of flavor and have just the right amount of moisture. You would never guess they are wheat-free and low-sugar. I actually found them a bit on the sweet side so you could scale back the agave a bit if you are watching your sugar really closely. I was cooking for guests (and I'm always trying to sell the clean lifestyle) so I made sure these had enough sweetness to keep them coming back for more. They loved them! On another matter, I have decided to scale back my blogging to four times a week. Until Easter weekend I did a post every day for well over three months. Why have I decided to cut back? I originally started this blog to document my recipes as I was just learning how to eat clean and wanted to make a cookbook and develop an arsenal of recipes to help keep us in clean food. As you can see by my MamasRecipes page I already have over 50 recipes documented - all of them successful experiments. I will still be experimenting and getting you new recipes, because that is what I do, but I'm actually ready and excited to start eating some of these clean recipes over again (so craving my lemon garlic chicken) and spend some time doing other things. I got that darn book "Young House Love" from the library and got on Pinterest and it sparked my interior design/DIY addiction to flare back up. So I've got cravings to do some interior decorating. I already got hubby to help me build a kids art wall (blinged out with back-lighting - he was so impressed about that - not quite). It turned out so cute. But I've still got some work to do on it and some other projects brewing in my mind. Oh the possibilities. My maternity leave is ticking by and I have some projects that NEED to get done before I go back to work. Not as fun as cooking, blogging or DIY'ing but things I need to get organized so things run a bit more smoothly when I go back to work. I need to get some pictures (of humans) organized and do our 2012 yearbook, I need to clean our storage rooms and I need to do some serious spring cleaning. The days are getting longer and some day spring will be here. With that will be lots more time spent outside with the kiddies (we like to hit the park several times a day), my flowers and hopefully a garden. And I might need to start working out in the evening if we want to spend more of our day outside. So I will be posting on Monday, Wednesday, Friday and Sundays for the time-being. I was really enjoying my Toxin Tuesday posts so I might throw those in here and there or move them to another day - we'll see. The fact that I'm ready to slow down on the blogging and documenting is really reflective of the fact that I'm kind of up the worst part of the learning curve of how to shop, cook and eat clean. It took a huge investment of time researching, finding ingredients and learning how to cook new foods. But I did it and now its become second nature to grab coconut flour instead of wheat, throw Chia seeds (in everything) and use coconut oil instead of canola oil. Its hard to believe I'm the same gal I was 6 months ago. I have completely and utterly changed how I eat - this is/was not a diet or a tweak - I did a complete overhaul. You can do it too. If you are just starting and feel overwhelmed and uncertain just stick with it - it was hard at first but before you know it you will be able to whip up a pumpkin brownie with no wheat just like that. Its not always easy but you will be rewarded with feeling better than you have ever felt in your life. Don't give up - you can do it! Seriously - you can! Preheat oven to 350 degrees. Combined coconut flour, salt and baking soda thoroughly. Add remaining ingredients and mix together until fully combined. Easy. Pour mixture into a well greased 8 x 8 baking pan. I used butter and it didn't stick at all. Smooth out the top with the back of a spoon or ladle. Bake for 30 minutes. Let cool and enjoy another guilt-free, clean recipe.